The global bagging machines market is driven by the high demand from the food packaging industry. Due to rising consumer dependency on packaged food product, the packaging manufacturers are emphasizing on machineries that can produce high volume, and have high productivity ratio. Bagging machines are highly compatible to meet the large volumetric requirement, particularly to match the need of the growing food industry. The global bagging machines market was valued at US$ 11.9 Bn in 2016 and is expected to be valued at US$ 18.4 Bn in 2025. The market is expected to grow at a CAGR of 5.0% in terms of market value, during the forecast period 2017-2025. The market volume for global bagging machines is expected to expand 1.5x during the forecast period 2017-2025. On the basis of product type, the global bagging machines market is segmented into open mouth bagging machine, form fill seal machine, valve baggers, FIBC machine, and others. Form fill seal machines are preferred over other packaging machines due to its high speed and high productivity ratio which makes it compatible for meeting the demand of food industry. FIBC bagging machines are expected to rise at a high pace as they provide bagging solutions for the bulk products like packaging cereals, flour etc. and also for the construction industry. Valve baggers are majorly used where cleanliness and efficient packaging is priority. Others bagging machines have very low percentage in the market. On the basis of automation type, the market is segmented into automatic bagging machine and semi-automatic bagging machines. Automatic bagging machines are preferred over the semi-automatic bagging machine as it reduces labour cost and increase productivity of the plant. On the basis of machine type, the market is segmented as vertical bagging machines and horizontal bagging machines. Vertical bagging machine dominates the bagging machines market. Due to affordable price and higher flexibility, vertical bagging machines are preferred over the horizontal bagging machine. Vertical bagging machines are compatible for high volume production and these machines are used manufacture pillow bags and gusted bags, which is not possible in case of horizontal bagging machines these features increases their demand in the market. On the basis of end-use industry, global bagging machines market can be segmented as food industry, construction industry, pharmaceuticals industry, household, personal care and cosmetics industry. Food industry is estimated to contribute the largest share of 59.8% in global bagging machines market. In terms of volume, this segment is expected to expand with a CAGR of 5.0% during the forecast period. Geographically, the global bagging machines market is segmented into the Middle East and Africa, Europe, Latin America, Asia Pacific, and North America. Out of all the regional markets, Asia Pacific is estimated to be the dominant one. Currently, it holds a share of 39.9% in the global market. Asia Pacific bagging market is projected to witness a steady growth in the coming years due to steady economies of China and India. On the other hand, the growth in Europe and North America is anticipated to remain slow but steady. Some of the players operating in the global bagging machines market include Robert Bosch GmbH – Packaging Tech, All-Fill Incorporated, Tokyo Automatic Machinery Works Ltd, I.M.A. Industria Macchine Automatiche SpA, PAYPER, S.A., Bossar Packaging S.A., CONCETTI S.P.A, Omori Machinery Co. Ltd, Fres-co System USA, Inc., WOLF Verpackungsmaschinen GmbH, Fuji Machinery Co. Ltd, Rennco LLC, Nichrome India Ltd, Hayssen Flexible Systems Inc., Imanpack Packaging and Eco Solutions S.p.A., STATEC BINDER GmbH, HASSIA-REDATRON GmbH, Premier Tech Chronos, MONDIAL PACK S.r.l, Pakona Engineers Pvt Ltd, Webster Griffin Ltd. The report begins with an overview of the global bagging machines market, evaluating market performance in terms of revenue, followed by TMR’s analysis of key trends, drivers, and restraints witnessed in the global market. Impact analysis of the key growth drivers and restraints based on the weighted average model is also included in the report. Transparency Market Research examines the global bagging machines market for the forecast period 2017-2025. The primary objective of the report is to identify opportunities in the market and present updates as well as insights pertaining to various segments of the global bagging machines market. To compute the market size, in-depth secondary research is done. Data points such as regional splits and market split by automation type, and product type has been assimilated to arrive at appropriate market estimates. The report comprises the forecast of the global revenue generated by the sales of bagging machines market. TMR triangulates the data via different analysis based on supply side, demand side as well as the dynamics of bagging machines market. TMR not only conducts forecasts in terms of value, but also evaluate the market on the basis of essential parameters, such as Year-on-Year (Y-o-Y) growth. This helps providers to recognize the future opportunities as well predictability of the market. Market numbers have been estimated based on extensive secondary and primary research, average pricing of bagging machines by product type and the revenue is derived through regional pricing trends. Market size and forecast for each segment have been provided in the context of global and regional markets. The bagging machines market has been analysed based on expected demand. Prices considered for the calculation of revenue are average regional prices obtained through primary quotes from numerous regional bagging machines manufacturers, suppliers, and distributors. All key end users have been considered and potential applications have been estimated on the basis of secondary sources and feedback from primary respondents. Country demand patterns have been considered while estimating the market for various end users of bagging machines in the different regions. Bottom-up approach has been used to estimate the bagging machines market by regions. Global market numbers by product type, by automation type, machine type, end use industry and capacity type have been derived using the bottom-up approach, which is cumulative of each country’s demand. The same has also been validated from top-down approach. Company-level market share has been derived on the basis of revenue reported by key manufacturers. The market has been forecast based on constant currency rates. Vital feature of this report is the analysis of the bagging machines market by product type, automation type, machine type, end use industry, capacity industry and region. The corresponding revenue forecast in terms of incremental dollar opportunity. This is traditionally overlooked while forecasting the market. However, incremental dollar opportunity is critical in assessing the level of opportunity that a provider can look to achieve as well as to identify potential resources from sales perspective of the global bagging machines market. 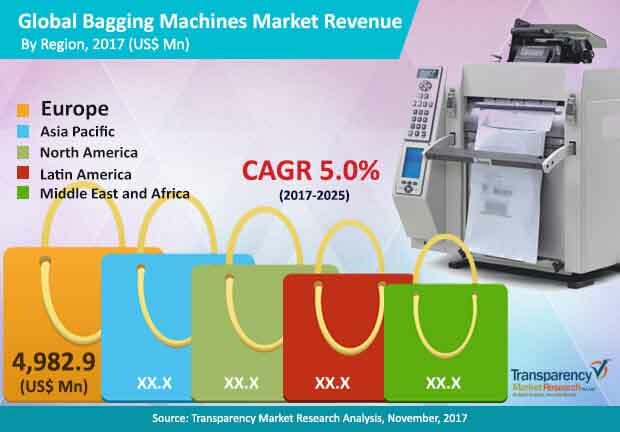 To understand key segments in terms of their growth and performance in the bagging machines market, Transparency Market Research has developed a market attractiveness index. The resulting index should help providers identify existing market opportunities in the global bagging machines market. In the final section of the report, bagging machines market competitive landscape is included to provide a dashboard view of companies that manufacture bagging machines. The report contains company profiles of some of the players in the global bagging machines market.